The Ferrite's Chip EMI suppresser is a ferrite bead for use to prevent. The EMI interference noise requirement of particular circuit from 7 ohms to 1,000 ohms impedance at 100 MHz. There are series different size from 1,608~4,532. These small size chips generating high impedance. 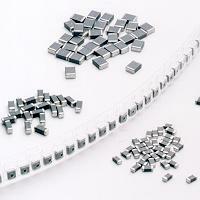 Minimum floating capacity and excellent high frequency characteristics. Outstanding soldering heat resistance. Both flow and reflow soldering methods can be use. Monolithic inorganic material construction for high reliability. Closed magnetic circuit avoids crosswalk an is suitable for high density printed circuit boards.